This year marks the second year that our friends in Speedway Region 52 have walked for kids at Cincinnati Children’s Hospital. 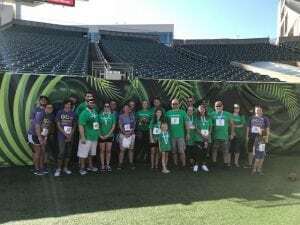 #TeamSpeedway participated in our newly rebooted Go the Distance for Cincinnati Children’s event at Paul Brown Stadium on September 15th. The team comprised of local managers and employees raised over $1,900 and will supports kids locally and nationally. Speedway, through their Children’s Miracle Network Hospitals partnership raises over $400,000 a year through in store change collection, round up at the register and their Miracle Tournament Golf Outing with 100% of those funds staying local and benefiting Cincinnati Children’s. Special thanks to all the Speedway employees who came and walked with us this year!